(The following recipes and portions of the text have previously appeared in both Buffalo Spree and Artvoice). In the same way that New York Style pizza is known simply as pizza in Manhattan and French fries are called fried potatoes (pommes frites) in France, chicken wings in Western New York are of course simply wings, not "Buffalo-Wings." 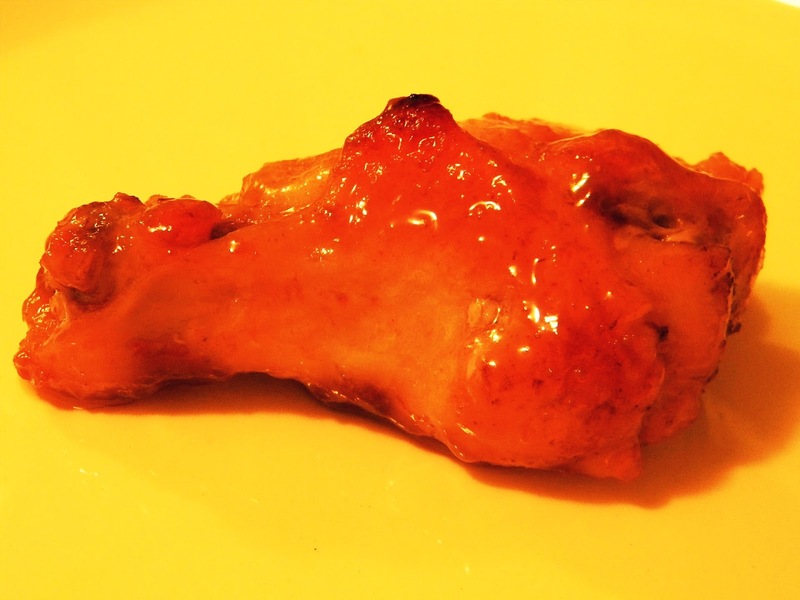 By now most people in this hemisphere know the origin of the humble chicken wing (cooked Buffalo-Style), but I truly cannot recall eating chicken wings until I was a teenager. This is partly because money was tight and we rarely ate out (pizza was rare treat), but this is probably also true because at that time “Buffalo-style” chicken wings were not that well known...when I was a child they were still in their infancy and a local treat. The first time that I actually realized they were a regional delicacy was in a music store in Nashville in the mid-1980’s. I was buying a cassette and mentioned to the clerk that I was from Buffalo. His eyes lit up and he asked me two things: if I was familiar with the band The 10,000 Maniacs and if I liked Buffalo wings. Before this I had never heard of them referred to as "Buffalo wings." Shortly there after while in the student center at the Culinary Institute of America (of all places) a classmate asked me if I wanted to order Buffalo wings. Up until this time it still hadn’t occurred to me that chicken wings—as a fried food—were unique to our region. I just assumed everyone ate them, like fries, or hot dogs and hamburgers. A couple years later I landed a job as cook at a French restaurant in the Garden District of New Orleans. One day the house butcher brought me a bowl of raw wings. Normally they went into the chicken stock but this day he had saved them upon the sous-chef's request. The sous-chef, who I feared more than the chef (primarily because the chef never spoke to me, or screamed at me like the sous chef), wanted me to make the staff wings for lunch. Most of the kitchen crew were Cajun and loved the greasy spiciness of the sauce. Hey, I thought, he was warned they were trés piquant, and I only made them medium. The phrase “Buffalo style” has of course taken on a life of its own when referring to recipes. In the same way Paul Prudomme's blackened foods scarcely resemble the food he likely ate as a child, “Buffalo style” is of course no longer simply for wings. A simple Google search yields more than 7 million hits. The resulting recipes offer everything from frogs legs (Buffalo legs) to vegan tofu. There was even a mention of “Buffalo Style ice cream,” with pieces of sugared blue cheese. Buffalo Style has finally jumped the shark. Chicken wings of course are not only suited to be fried and tossed in butter and hot sauce; nearly any flavor combination or cooking technique works for these delectable poultry morsels. They are also not solely destined as a snack food. Chicken wings are a viable protein that can be utilized in a myriad of recipes. This was illustrated to me some years ago while training under an Italian chef, who learning I was from Buffalo, told me that frying wings was only one way to cook them, and that his favorite was to stew them in rice. He made the dish for staff lunch and it was delicious. I made roasted honey-soy wings for my son tonight for dinner (those pictured). I coated them in honey, soy, ginger, garlic, and a sprinkling of cornstarch. They were delicious (I had a few, too). But I couldn't help but wonder, seeing that I am a born and bred Buffalonian, and I made these in Buffalo...are these Buffalo Style. Combine the spices and honey together in a large bowl and mix together. Add the wings and toss to coat them thoroughly. 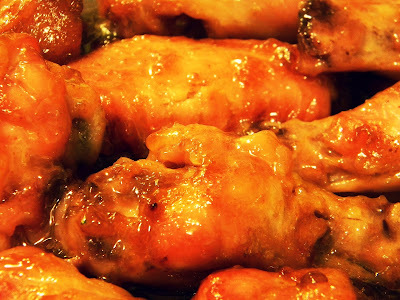 Refrigerate the wings to marinate for 1 hour. Preheat an oven to 325F. Stir the wings then arrange them on a wire rack over a baking sheet (if you do not have a wire rack parchment paper may be used). Bake the wings for about 25 minutes, turning them after 15 minutes. The wings are done when they are deep golden brown, no pink remains around the bone when cut open, and their juices run clear. Combine all the ingredients except the wings in a food processor and purée until smooth. 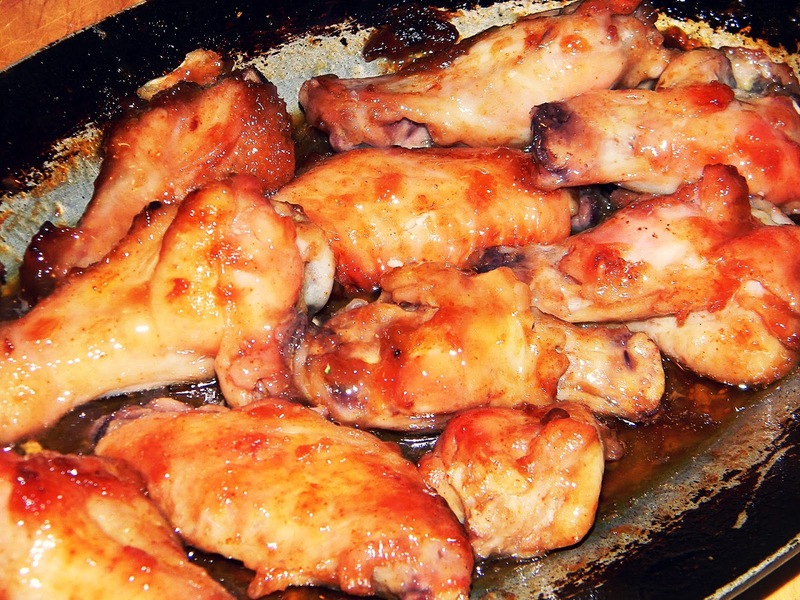 Toss the chicken wings with the marinade and refrigerate 1 hour or over night. Roast or grill the wings 30 minutes, or until fully cooked.